Liverpool FC's official charity, the LFC Foundation, has announced the first ever official Legends game to be held at Anfield. 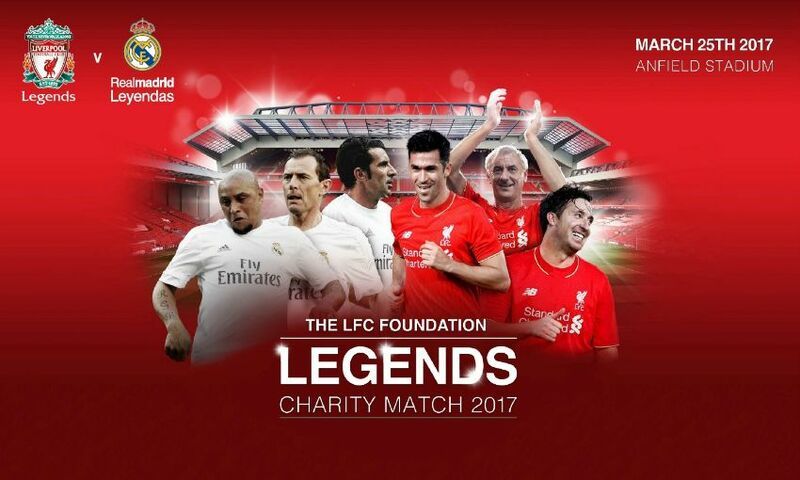 This spring, Liverpool FC Legends will play Real Madrid Legends in a return charity match on Saturday March 25, 2017. The game will see the Reds take on the Spanish giants in a rematch of the Corazon Classic, which took place in June 2015 at the Santiago Bernabeu. Real Madrid came from 2-0 down to beat the LFC Legends 4-2 in a thrilling game in front of a 70,000-strong crowd. Club ambassador Robbie Fowler will captain the Reds with the hope of claiming victory in front of the Kop, while record goalscorer Ian Rush will also act as player-manager for the team. Some of the star former players confirmed to play in the Legends side include: Gary McAllister, Luis Garcia, Jamie Carragher, Patrik Berger, Salif Diao, Jerzy Dudek, Stephane Henchoz, Jason McAteer, Vladimir Smicer, David Thompson, Bjorn Tore Kvarme, Sander Westerveld, Dietmar Hamann, John Aldridge, John Arne Riise, Phil Babb, Daniel Agger and Michael Owen. Real Madrid’s team will also feature a top line-up of footballing stars, including Roberto Carlos, Emilio Butragueño, Luis Figo and Steve McManaman. All proceeds from the match will go to the LFC Foundation, the club’s official charity. The aim of the LFC Foundation is to make a real difference to the lives of children and young people. Funds raised will support the charity’s programmes and partnerships, which aim to improve the health and life chances of children and young people in Merseyside and beyond. Tickets for the game are priced at £20 for adults and £5 for juniors. Click here for ticket selling details. Hospitality starts from £50 per person – call 0151 264 2222 for details, or visit bookings.liverpoolfc.com/events. For more information, please visit our ticketing page.